Photo: Courtesy of Diego Enrique Flores. As someone who prides herself on her personal style, I love tagging along my friends' shopping trips to give them my two cents. My friend Adam recently asked me to help him find a new outfit for a first date, to which I happily obliged. Shopping may not come easily to some guys, so it's important to listen to their concerns and find a balance between their personal style and your ideas. Here are the two looks that we picked out together, one for a date, and one for work. First dates can be daunting, so the best advice is to go with something you feel comfortable in. A simple jeans-and-shirt combo was the way to go for Adam's casual style. 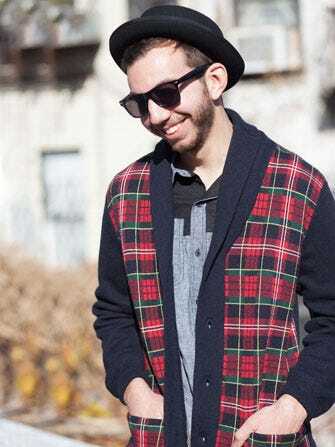 We added this amazing plaid sweater from Grayers to dress up the ensemble a bit. I coaxed him into getting the hat, and he didn't hate it. We grabbed some pieces from Frank and Oak for the foundation of this look. A few key pieces are essential to a work wardrobe, like a killer pair of trousers in a neutral tone. You can rewear them over and over again with different outfits. To complete the look, I had Adam try on this varsity/bomber jacket hybrid by Lifetime. He felt a little "retro" in it, but a vintage inspired touch was just the right amount of flair. 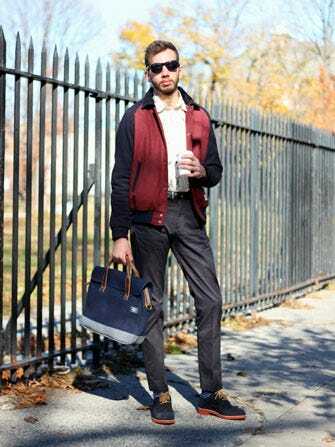 Lifetime Collective St. Germaine Varsity Jacket,” $298, available at Acrimony; Frank and Oak Deer Isle Printed Shirt, $45; Taylor Easy Care Trousers, $65; Canvas and Suede Brief, $105; Suede Classic Brogues, $140, all available at Frank and Oak; Peugeot watch.